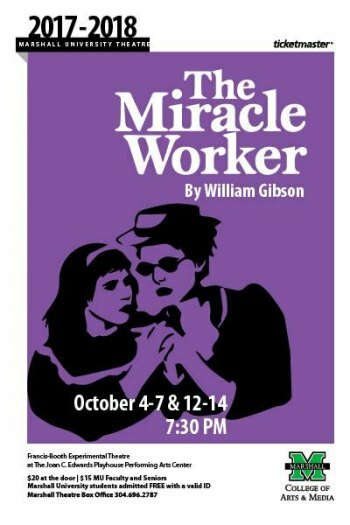 Marshall University Theatre kicks off the season October 4 – 7 & 12 – 14 7:30 PM with "The Miracle Worker." Presented at the Francis-Booth Experimental Theatre in The JCE Performing Arts Center, William Gibson’s 1960 Tony Award for Best Play was adapted from Helen Keller’s autobiography, The Story of My Life. This classic play tells the story of Annie Sullivan and her student, blind and mute Helen Keller. The Miracle Worker dramatizes the volatile relationship between the lonely teacher and her charge. Trapped in a secret, silent world, unable to communicate, Helen is violent, spoiled, almost sub-human and treated by her family as such. Only Annie realizes that there is a mind and spirit waiting to be rescued from the dark, tortured silence. With scenes of intense physical and emotional dynamism, Annie’s success with Helen finally comes with the utterance of a single, glorious word: “water”.